US-backed forces hit by onslaught of ISIS suicide attacks around Manbij; Hezbollah suffers serious casualties elsewhere. Islamic State group (ISIS) jihadists have launched a wave of suicide and car bombings to defend a besieged stronghold in northern Syria against US-backed fighters, a monitor said on Saturday. A Kurdish-Arab alliance last week encircled the city of Manbij and severed a key supply route used by ISIS from the Turkish border to the jihadists' de facto Syrian capital, Raqqa. But since then the Syrian Democratic Forces (SDF), supported by US air strikes, have been slowed by almost daily suicide bombings by ISIS, the Syrian Observatory for Human Rights said. On Friday, ISIS carried out two suicide attacks and five car bombings in the southwestern suburbs of Manbij, according to the British-based monitor, which relies on a network of sources on the ground. The number of casualties from the attacks was unknown, but hundreds have been killed since the offensive to retake the city from ISIS began on May 31. According to the Observatory, a total of 352 ISIS fighters and 37 SDF combatants have died, as well as an estimated 78 civilians. The operation has also been complicated by the presence of tens of thousands of civilians trapped in the city, although more than 1,000 have managed to escape with the help of the SDF. "On Friday, six members of the same family were killed when they were targeted by jihadists while fleeing," Observatory head Rami Abdel Rahman said. SDF commanders have accused ISIS of using civilians as human shields. Southeast of Manbij, regime forces backed by Russian air strikes have also faced ISIS counterattacks after advancing towards another jihadist bastion, Tabqa. The town lies around 50 kilometers (31 miles) west of Raqqa city, and recapturing it would cut a key supply route. The army is now reported to be 15 kilometers away from Tabqa's military airport. Syria's five-year conflict has evolved into a multi-sided civil war involving a range of combatants including Western- and Gulf-backed rebels, jihadists, Kurds and pro-regime forces supported by Russia and Iran. The northern province of Aleppo in particular has been carved up by a complex set of front lines and key supply routes, and has seen some of the worst fighting. Opposition-held areas of Aleppo city were hit by fresh barrel bomb attacks on Saturday, while rebel fire killed seven civilians in a Kurdish-majority neighborhood, the Observatory said. South of the city, rebel groups backed by Al-Qaeda affiliate Al-Nusra Front were locked in battles with government forces and allied militia. Since Tuesday, 186 fighters have been killed in those clashes - 100 rebels and jihadists along with 86 members of pro-regime forces, including 25 from Lebanese Shiite jihadist group Hezbollah, the Observatory said. 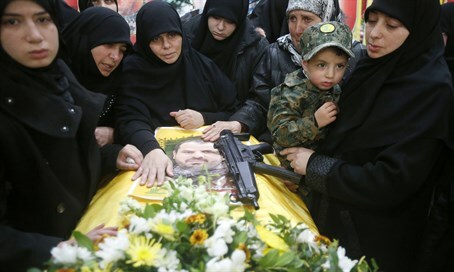 "It's the highest toll for Hezbollah fighters in a single battle," said Abdel Rahman. The Syrian conflict has killed more than 280,000 people and displaced millions since it began in 2011 with the brutal repression of anti-government demonstrations.